Home Tags Posts tagged with "f60 america"
Ferrari has unveiled the new F60 America, a car designed to celebrate the carmaker’s 60th anniversary in North America, on October 10. F60 America is the latest in a long line of beautiful one-offs and limited-run cars based on standard Ferrari models, with bespoke bodywork and interior clothing the mechanicals of an F12 Berlinetta. In the tradition of pure roadsters of the Fifties, the F60 America has a light fabric top that Ferrari promises will remain in place up to 75 mph. But the twin roll hoops and flying buttresses notwithstanding, this is about as pure a roadster as one can hope to buy in the 21st Century, meant to be driven with the top completely removed, the cabin open to the sky. 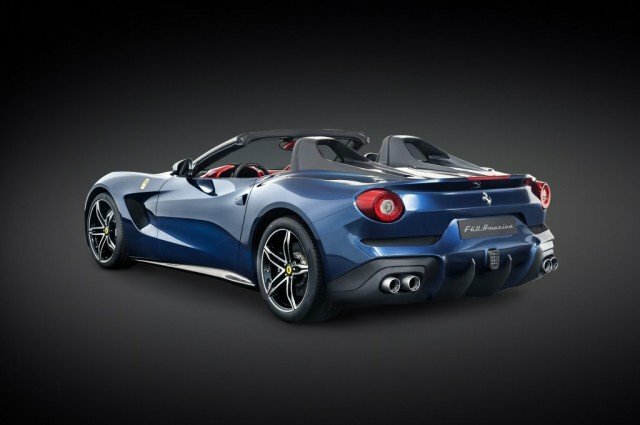 F60 America is powered by a variation on the 731 horsepower 6.3-liter V12 of the F12berlinetta, mounted front-mid-engine. With all that power shooting through a seven-speed dual-clutch gearbox, F60 America should run past 60 MPH in about three seconds, and beyond 100 MPH in just over seven seconds. Just 10 F60 Americas will be built and Ferrari says that they have already been sold, with each car costing an eye-watering $2.5 million.